Weeneebayko Area Health Authority is proud to announce that we received a generous $50,000 donation from the Marcel and Frances Labelle Foundation in July of 2017. 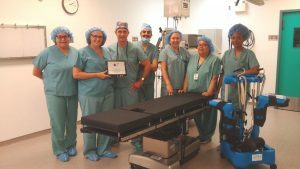 The donation was used to purchase a brand new surgical table for the Weeneebayko General Hospital, Moose Factory. Marcel Labelle has a history of overseeing construction projects within our Region, including the Moosonee and Attawapiskat airstrips. The surgical table arrived in early August. WAHA wishes to thank Dr. Gerhard Klassen for connecting us with the Foundation.